Last year my husband and I took a trip to Washington D.C for Veteran’s Day. 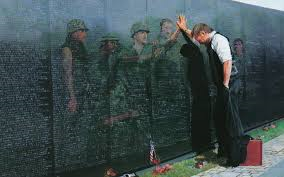 We have a dear friend who is a Vietnam veteran and we wanted to experience the Vietnam Veterans Memorial with him. Neither one of us had ever been and we wanted to see it through his eyes. I noticed as we started walking towards the memorial, a sea of Vietnam veterans. They were easy to spot because they were all wearing either a hat, a vest, or both identifying them as such. Our friend was no different. As we walked past them I could hear our friend saying, “welcome home” and “thank you for your service!” Those same words were returned to him. Over and over again throughout the day, these words were exchanged between these veterans. Later that evening, I asked our friend about the significance of “welcome home” and “thank you for your service” to him and his fellow veterans. He explained that these words are their way of acknowledging to each other how difficult it was over there, how blessed they were to be here today, and as a show of support to one other. If you’re not old enough to remember, you have probably read or heard about how our Vietnam veterans were treated when they returned from war. It makes perfect sense that they would acknowledge one another in this way. With Veteran’s Day in a few days, I can’t help but step back and reflect on the words “thank you for your service!” Serving our nation is not an easy way of life. It comes at a cost. Some pay the ultimate price while others may struggle with the lifelong effects and scars of war. Transitioning from military life into being a civilian can be difficult for some. Learning how to find that new normal after years of serving your country can be a struggle. If you are experiencing any difficulties, I would like to encourage you to reach out. There are many organizations including the VA with resources available to you. Click here to see what is available from the VA. If you are a veteran in crisis, today, I want to encourage you to ask for help. You can reach out to the Veteran’s Crisis Hotline @ 1-800- 273-8255 and press #1 and someone will be there to help you. We are a community and a family. If you know a veteran who is struggling, reach out, give them a hand, and lift them up. They need you!